Want to hang out with Sam Waksal, Kevin Kinsella, and many other biotech bigwigs? Here's how. Calendar double-take of the day: there are only two weeks left until our big New York biotech event—and your big chance to hang out with the likes of Sam Waksal and Kevin Kinsella. Waksal, of ImClone fame, and Kinsella, founder of Avalon Ventures, will join Cancer Research Institute CEO Jill O’Donnell-Tormey and Enumeral Biomedical CEO Arthur Tinkelenberg to hash out some of the big questions facing the life science industry in New York. Dennis Purcell, senior managing partner at Aisling Capital, will do his best to keep them all focused on one, er, modest goal (and the name of the event): Reinventing Biotech’s Business Model for the Big Apple. Purcell will also make sure that there’s ample opportunity for attendees to join the conversation. And, as is our custom, we’ll be pouring some drinks and passing some appetizers after the formal program, so the opportunities for idea-sharing and shoulder-rubbing will continue into the evening. This will all go down in the swanky new Apella event space at the Alexandria Center for Life Science on October 4 from 5:30 to 8:30 p.m. Tickets are limited, and going quickly, so it’s a good idea to register sooner rather than later. We’ve also got some nice discounts available for students and startups, so be sure to take a look at those. 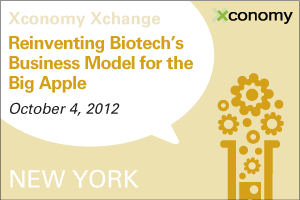 And for you biotechie Twitter users, here’s the hash tag to follow: #xcbiobizNY. We look forward to seeing you in a couple of weeks.